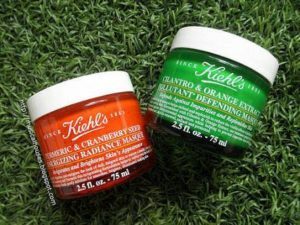 Product review – Kiehl’s Turmeric & Cranberry seed, Cilantro & Orange extract face masques are totally fabulous for your skin. The turmeric and cranberry masque is great for normal-oily skin. It acts as a masque and a scrub and once a week usage is recommended. I felt refreshed after using this. It leaves the skin clean, soft and radiant without making it dry. Not recommended on acne. The cranberry seeds act as a gentle exfoliator and remove the dead skin cells. Directions– Wash you face and pat dry, apply a generous amount on the face and neck. Let it naturally dry for 10-15 minutes and then take a few drops of water on your fingers and slowly start massaging. Rinse and pat dry. The cilantro and organge masque works as an overnight pack to give you hydrated and supple skin in the morning.The mild fragrance of the ingredients is actually very pleasant as compared to other masques that are loaded with artificial fragrances. It can also be applied as a 5 minute quick moisture masque. I simply love the texture of this masque. The skin absorbs all that it needs and feels really soft. I have also noticed that the pack works wonders for oily skin as well because it helps in making the skin supple, which reduces the appearance of open pores. What is HD​ MAKEUP​ or High Definition Makeup?